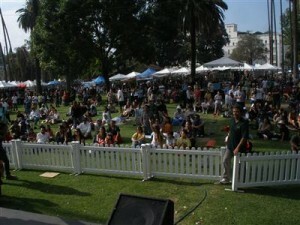 My band, Elson and the Soul Barkada, played today at the Lotus Festival in Echo Park for the sixth consecutive time. Being that there was no Lotus Festival last year, it was nice to expect the same festival atmosphere for the past thirty-something years. What wasn’t expected was rain, which fell lightly in the middle of our 25-minute set. It was a nice Lotus Festival, save for the fact that it lacked the traditional Dragon Boat Races, Saturday night fireworks display and of course – the bed of lotus flowers in Echo Park Lake. Read the full details (and watch some video) on my elsongs.com blog.